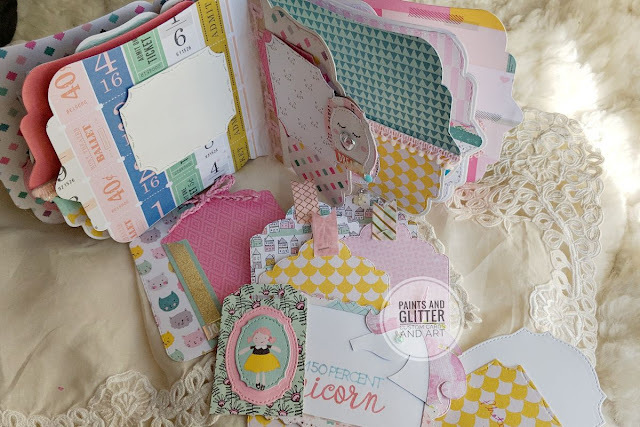 I am here with a brand new set of dies from Tonic Studios and yet another adorable mini album! This one is perfect for a little girl, a mother of a little girl, or a cat lover, or all of the above! 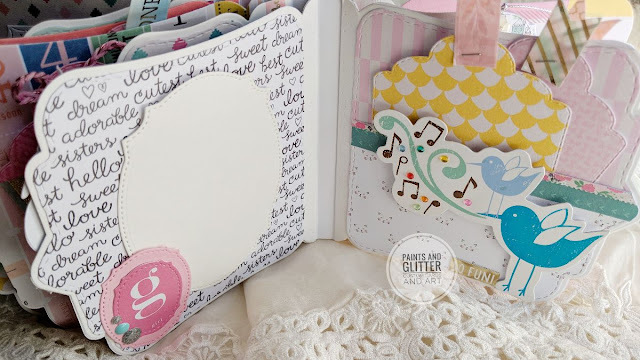 I am thrilled with this collection of dies, and how easily I am able to put paper on pages to assemble the perfect little personalized gift! On the cover, and throughout, I have used the CUTE GIRL collection from Crate Paper. As a cat-lover, I could not resist, and the floral designs were easy to repeat with the layered Tonic die-cut that I assembled and colored using Nuvo Pens and Nuvo Glitter pen. The little roses all have some sparkle! The cluster of flowers is all handmade by yours truly, and I used Sizzix Dies by Tim Holtz, felt, and small pearls that I stitched together. The cat, butterfly, and flower buttons helped me complete the look. Adorable!! The spine of a book is equally as important as the front. So for this, I used all the little strips left over from my favorite papers in this collection, and I created a striped collage. To top it off, I used a gorgeous bow topped with a flower and a pink pearl. The scalloped edge of this bow is perfect with its dainty details! This is the front page, where I used dies from the Memorable Moments collection, as well as Nicole Silhouette for frames. Layering frames throughout this little book allowed me to extend the page sizes without compromising the pretty shaped pages. 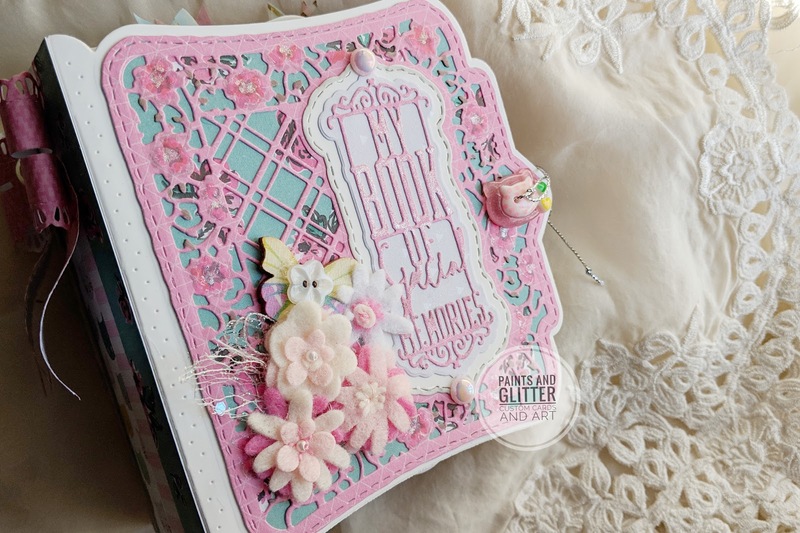 I also used the dies intended for the spine to weave a pretty ribbon for an added pop of color! I just adore the kitten faces and the hand-written sentiments of the papers! Perfect list if you ask me!! 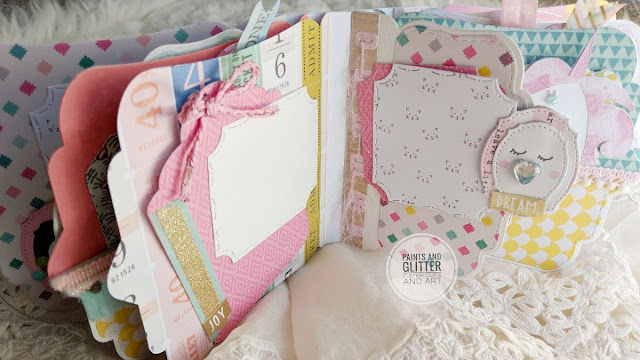 This page layout begins on the left with a pocket page, with an added tag & envelope that will hide sentiments,or hold small pictures. The pocket is lined with handmade trim that I cut into an adorable fringe, and a pom-pom ribbon in soft pink and grays. 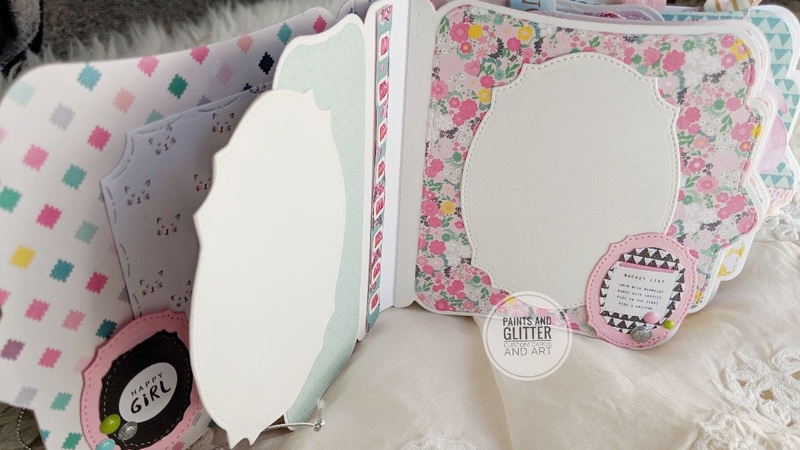 On the right, I used a cute pink kitten from the paper collection to make an adorable embellishment on the bottom half of the page, but left room for another photo. The opposite page is more playful. I used another image from the collection and topped it with a cute heart glass nose. 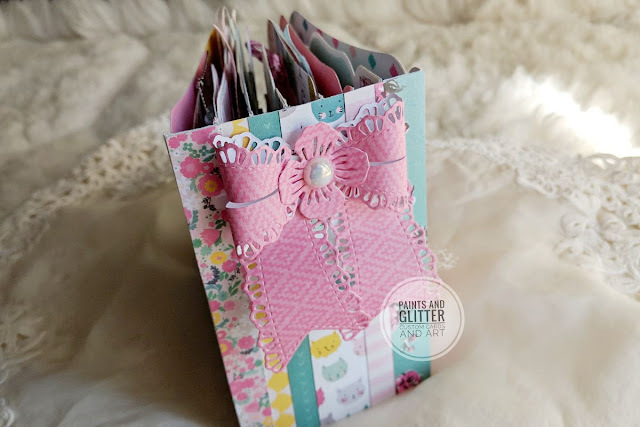 The page also has added texture with the soft pink fibers I threaded through the design. The frame is double matted for extra depth. Here I created a whimsical page layout with a kitten from Santoro London Gorguss Girls, and the sentiment: Best Friends. The kitten sits next to a flower and shiny gems. Opposite, there is a pocket lined with pink delicate pom-pom trim, a small flower, and a cute insert with the elusive Unicorn with a glimmery blue eye. It reads: I am 50 percent Unicorn. The Happiest Girl in the Whole Wide World. 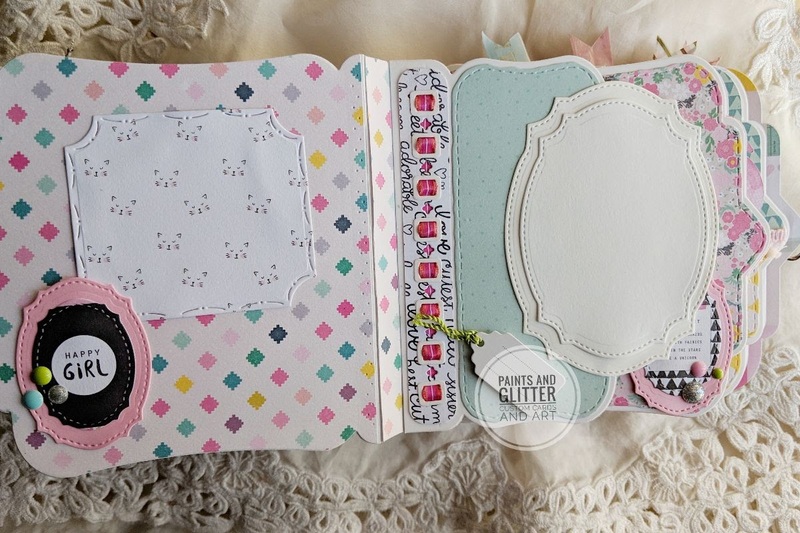 This adorable page layout shows the simple monogram G for Girl. 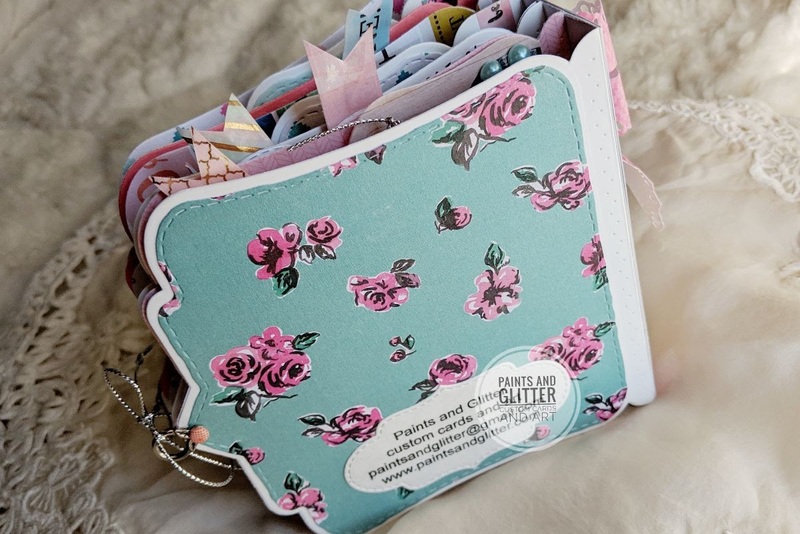 Opposing this page, the two little birds sing with swirls and gems, and the pocket page reads: So Fun!The tags all have small flags I attached with my Tim Holtz tiny attacher and adorable Washi tapes from my stash! 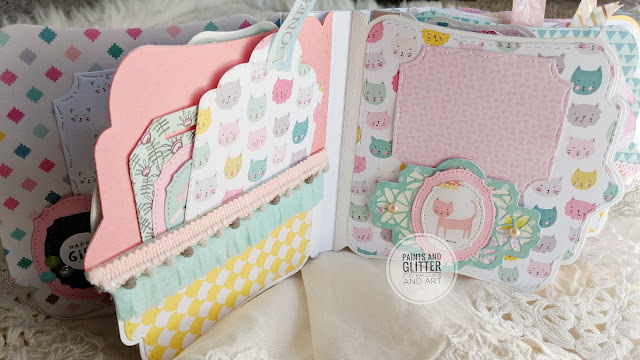 The pocket contains extra tags as well as photo mats that serve as templates .This book is adorable, and complete!! 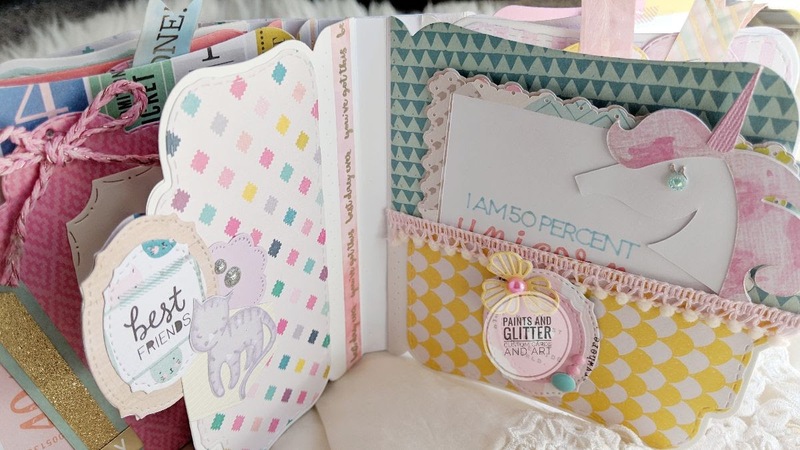 Here are all the goodies included in this tiny but adorable book! Can you believe all of that was in there?? On the back, I used a floral paper to match the front, and small brad holds the loop closure. The silver string allows you to tie this little beauty closed. 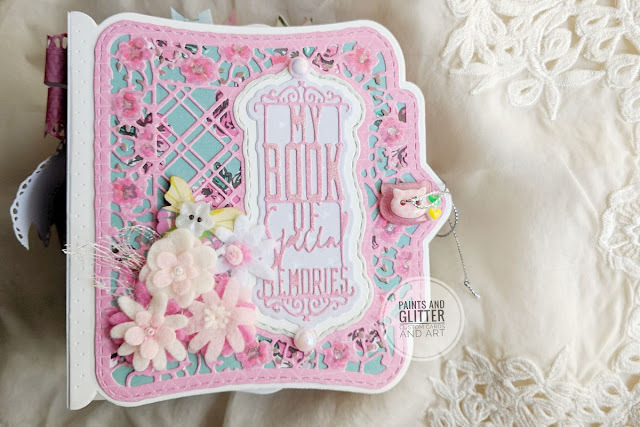 Memorable Moments Mini Album for Spring! Mini album in Carrying Case! Christmas gifts, Quick and Easy!